HARRISBURG, Pa. (Legal Newsline) -- The Pennsylvania Supreme Court was expected to hear two cases challenging the state's mandatory retirement age for judges during an oral argument session held in Harrisburg Wednesday. In March, the state's high court agreed to hear Driscoll v. Corbett et al. and Tilson v. Corbett et al. According to The Legal Intelligencer, the court will hear Driscoll first, then Tilson, and decide whether the state's mandatory retirement age is discriminatory and violates the Pennsylvania Constitution. Under the state's constitution, judges must retire at the end of the year in which they reach age 70. They may continue working as senior judges. However, as senior judges, they do not receive the same salary or benefits. 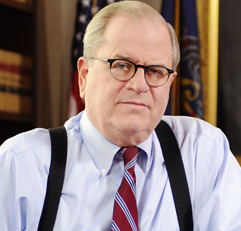 In Driscoll, Westmoreland County Court of Common Pleas Judge John J. Driscoll, Philadelphia Court of Common Pleas Senior Judge Sandra Mazer Moss and colleague Judge Joseph D. O'Keefe want the mandatory retirement provision nullified and declared invalid, and have the court enjoin the defendants from enforcing the provision. The named defendants in both cases are Gov. Tom Corbett, Court Administrator Zygmont A. Pines and Pennsylvania Secretary of State Carol T. Aichele. In Tilson, Montgomery County Court Judge Arthur Tilson argues that the constitutional requirement is at odds with the Pennsylvania Constitution's guarantee of equal rights. He, too, wants the provision nullified and declared invalid.